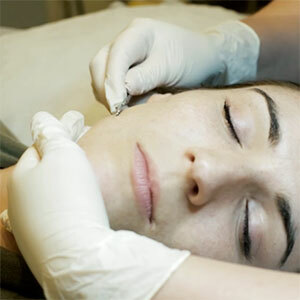 Electrolysis is a way of removing individual hairs from the face or body by inserting a probe into the hair follicle followed by an electrical pulse that is sent through the probe. If the particular hair follicle that is being treated is in its active stage of growth, it will most likely not grow back again. Electrolysis can most often be the best alternative for individuals with blonde, red or white hairs which may not be suitable for laser. During your procedure you may feel a slight discomfort. Do not wax, tweeze, or use hair removal devices 2-4 weeks prior to your Electrolysis treatment. The area to be treated must be clean. No makeup should be applied and the application of lotions, creams or serums should be avoided. We understand that there may be times that this is unavoidable so please let your clinician know and she may remove the product for you. Upon arrival you will be asked to fill out a consultation form which will include questions about your skin and hair type, medical conditions, previous treatments, etc. You will then have a private discussion with an experienced clinician who will assess your individual requirements, suggest a tailored plan and take you through the details of the treatment including pre-care and aftercare. This will also give you the opportunity to have any questions or queries regarding your treatment answered. At Clinica Lase we use state of the art medical electrolysis machines for hair removal and all our clinicians hold government approved qualifications. We pride ourselves on both our knowledge and experience but also on our thorough consultations that ensure we have all the necessary information to minimise the risk of complications. With a new client we will often start by administering a small test patch so that we can assess the skins reaction and patient comfort level before proceeding to full treatment. At Clinica Lase, you can be sure that your safety is our first priority. Post procedure, some redness and swelling can occur. This generally can last from as little as 2 hours to anything up to 3 days. If you experience any discomfort during this period you may apply a cold compress or alternatively an ice pack to the area. However, if you continue to experience any discomfort please notify your clinician immediately. It is mandatory that you keep the treated area clean and bacteria free. Avoid any excessive sweating 24 hours post procedure as sweat can cause bacteria to enter into the open follicle and may cause the area to break out or become infected. For two weeks post procedure it is very important that you avoid UV exposure and tanning. This includes the use of solariums. The application of an SPF 30 to the treated areas is mandatory as they become very photosensitive and may be more prone to develop pigment.